Tucked into the Northeast corner of Washington, DC lies the US National Arboretum, a large park dedicated to the study and conservation of plant life. The arboretum contains many beautiful green spaces, trails, and historical installations that appeal to visitors of all kinds. Read on to learn more about what to do at the US National Arboretum. With its 446 acres of green spaces in Washington, DC, the US National Arboretum is a lovely place to spend a sunny afternoon, strolling around some of the park’s beautiful nature areas. Established in 1927, the National Arboretum serves as one of the largest green spaces in the DC area. Composed of several different gardens, forest areas, and exhibits, the arboretum serves as a place for botanical cultivation and study. Among some of its notable exhibits include the Asian Collection, the Friendship Garden and Arbor House, and the famed Capitol Columns (pictured below). Accessible by a winding pathway into a forested area, the Asian Collection has several species from Japan, Korea, and China. Here, you’ll find bamboo, Kousa dogwood, and other stunning plant species from our Eastern counterparts. There are also lovely walking trails, beautiful pagodas and decor, and places to sit and watch the world go by. Perhaps one of the most famous parts of the Arboretum is the Capitol Columns. 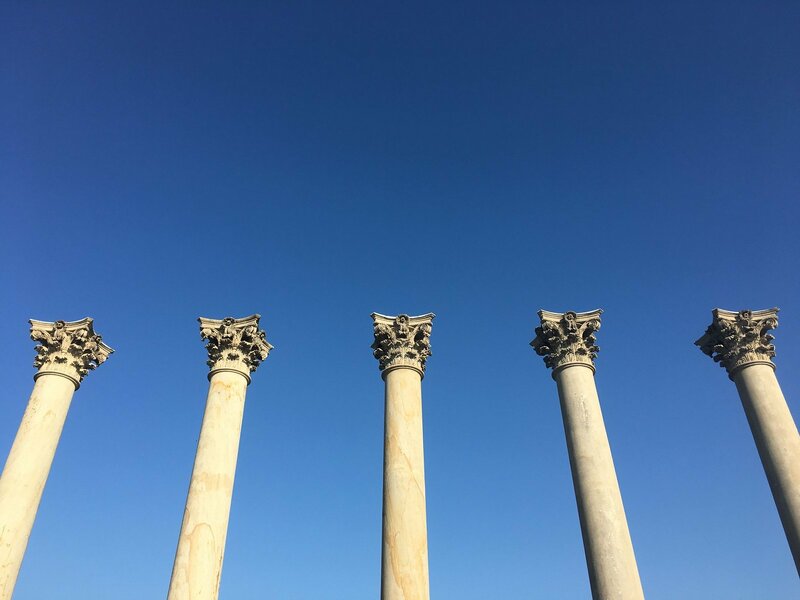 These strange columns used to line the Capitol before they were removed in 1958 and brought to this 20-acre area of the US National Arboretum. Here, you can find a few walking trails, a reflection pool, and of course, the majestic columns themselves. Although I didn’t get a chance to do everything during my trip to the US National Arboretum, I’m planning on returning soon to check out the Bonsai exhibit, the Friendship Garden and Arbor House, and the National Herb Garden. I’m also hoping to return to the area during different seasons to experience what it looks like during different times of year. I’d imagine it’s really beautiful in the spring! A trip to the US National Arboretum is definitely worth taking if you’re in the Washington, DC area. Not only does it offer peace and tranquility from the chaos of the city, but it’s also a historically significant and naturally beautiful place where visitors can simply get lost and wander around for hours at a time. Need a place to stay in Washington, DC? Check out our handy guide. Have you ever visited the National Arboretum? How was your experience? Share your thoughts in the comments!